~Visit the Lingyin (Soul’s Retreat) Temple, one of the oldest and best preserved Buddhist Temple in China. ~Visit the Huanggang Guanyu (Viewing Fish at Flower Harbor) Park and see its Red Carp Pond scenic spot. 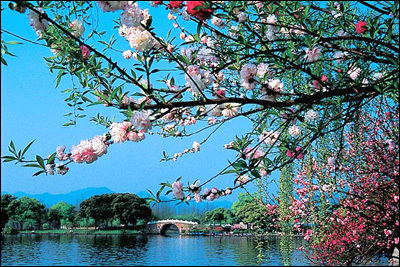 ~Come to the West Lake and enjoy a lake cruise to appreciate the famous heaven-like scenery there. ~Visit the Dragon Well Tea Village, the producer field of dragon well tea.